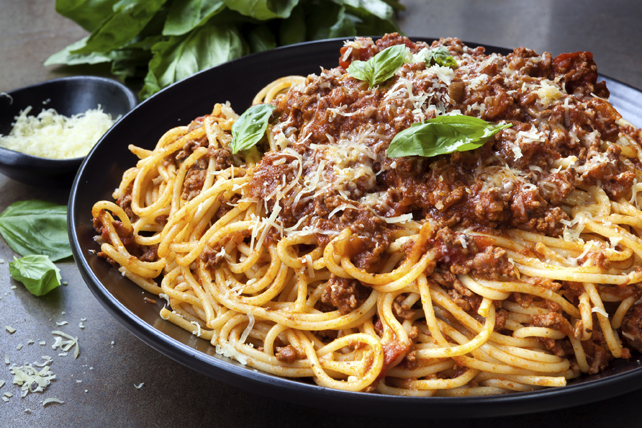 This super-simple Spaghetti Bolognese is sure to wow your guests' taste buds! Brown meat with onions and garlic in large skillet on medium heat, stirring occasionally. Add all remaining ingredients except spaghetti and cheese; mix well. Bring to boil; simmer on medium-low heat 45 min., stirring occasionally. About 15 min. before meat sauce is done, cook spaghetti as directed on package, omitting salt. Drain spaghetti. Serve topped with meat sauce and cheese.